New and Improved Strawberry Pie | I Wanna Bake! At it’s core, this pie is essentially a banana cream pie that had a major strawberry makeover. 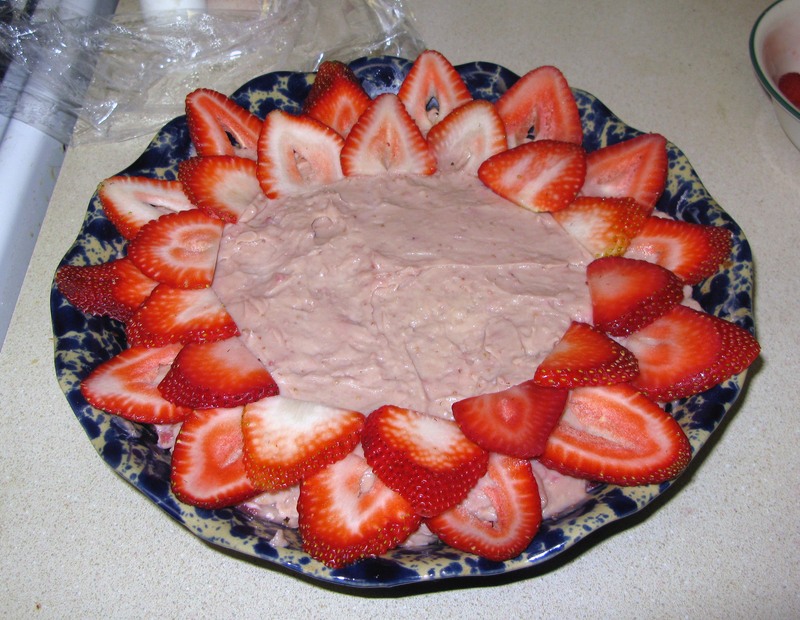 There are three layers of sliced strawberries, an impressive (and easy to make) flower decoration made out of strawberry slices on top, and even the custard is strawberry-flavored. 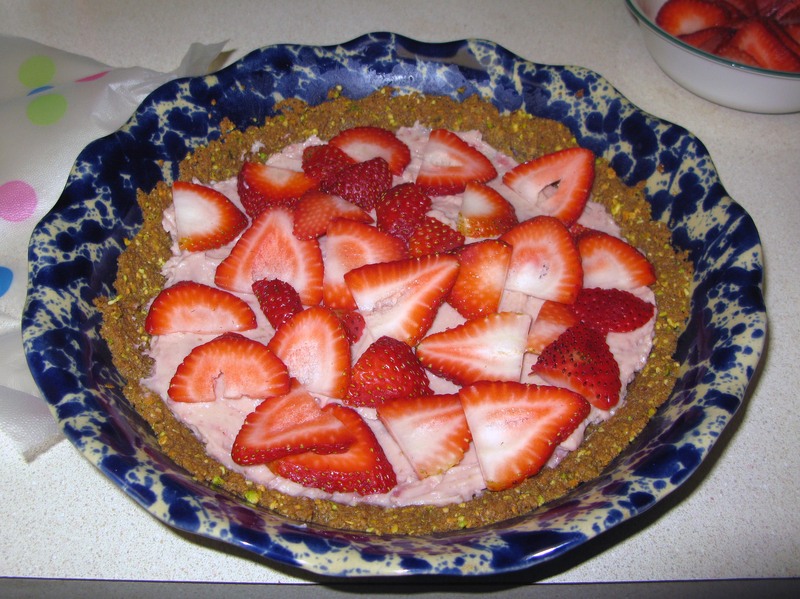 Between the pie itself and my habit of snacking on my ingredients while baking, I went through about two pounds of fresh strawberries and one package of freeze-dried strawberries making this. You might be able to get away with one pound if you make your layers sparser and are less fussy with the sizes of your decorative pieces, but I’d recommend having an extra pound on hand just in case. After all, if you’re making this pie, chances are you like strawberries. I based the recipe on the banana cream pie recipe in Joy of Cooking. To get from banana cream to strawberry, I added ground up, freeze-dried strawberries to the vanilla custard, used strawberry slices instead of banana slices (obviously), and opted to cover the top with strawberries instead of the usual whipped cream. You could add a whipped cream layer if you were so-inclined, but I felt the pie was just right without it. If you do try it with whipped cream, I’d recommend cutting the tops off some strawberries and standing them up in the whipped cream on their cut ends around the edge of the pie. This is probably going to come out of nowhere, but this week’s recommendation is Judas Priest. They have absolutely nothing to do with strawberry pie, I’ve just been into them lately (and my cat’s theme song is “Breaking the Law” when she’s being bad, which is often of late). First, prepare your crust according to these directions. Turn off your oven and set the crust aside to cool completely. Next, grind your freeze-dried strawberries into a fine powder using a stand mixer. You can sift it to remove any remaining large-ish pieces, or you can just leave them in. They will re-hydrate when you add them into your custard, but they do make the texture a little weird because. That said, once everything’s put together, you don’t really notice. In summary, whichever approach you choose will work out fine. Carefully separate your eggs (here’s a tutorial). Set the yolks aside for now and reserve the whites for something else (macarons, anyone?). 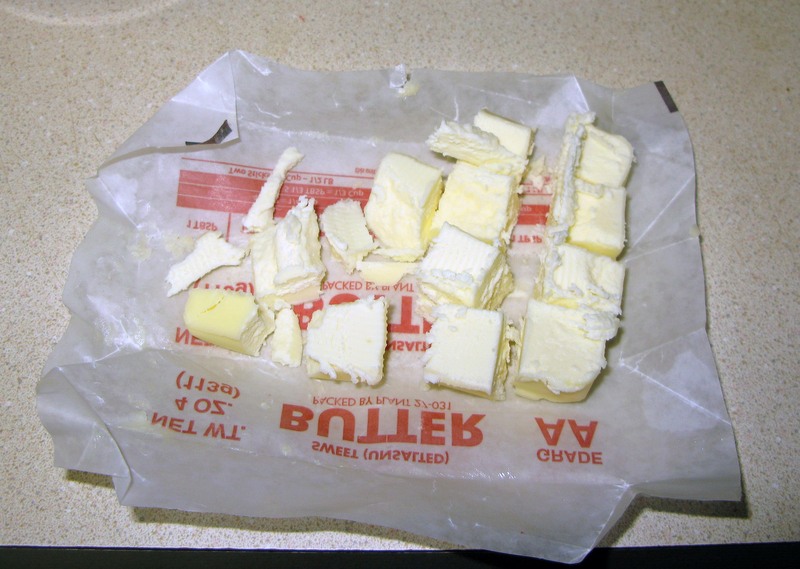 Cut your butter into cubes and set these aside as well. 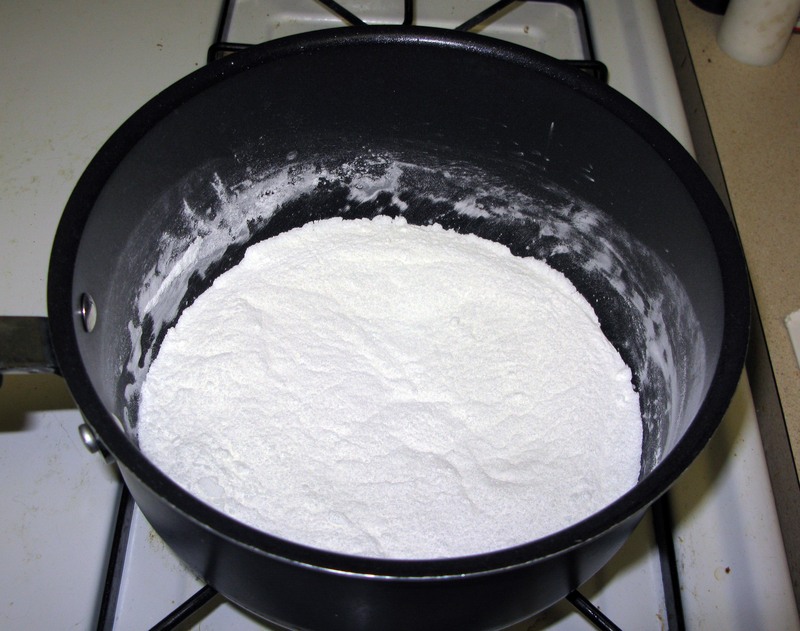 In a medium saucepan, whisk together the sugar, cornstarch, and salt. 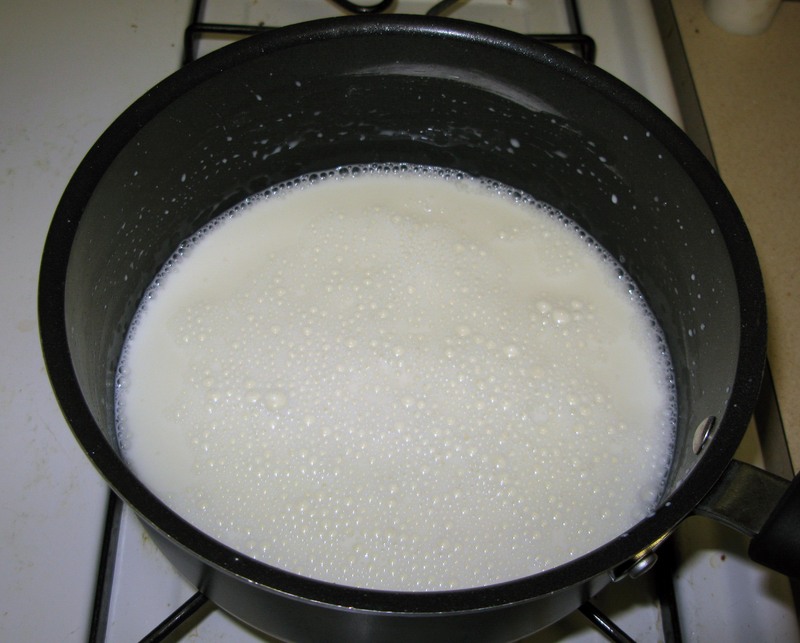 Whisk in the milk until the dry ingredients are dissolved. 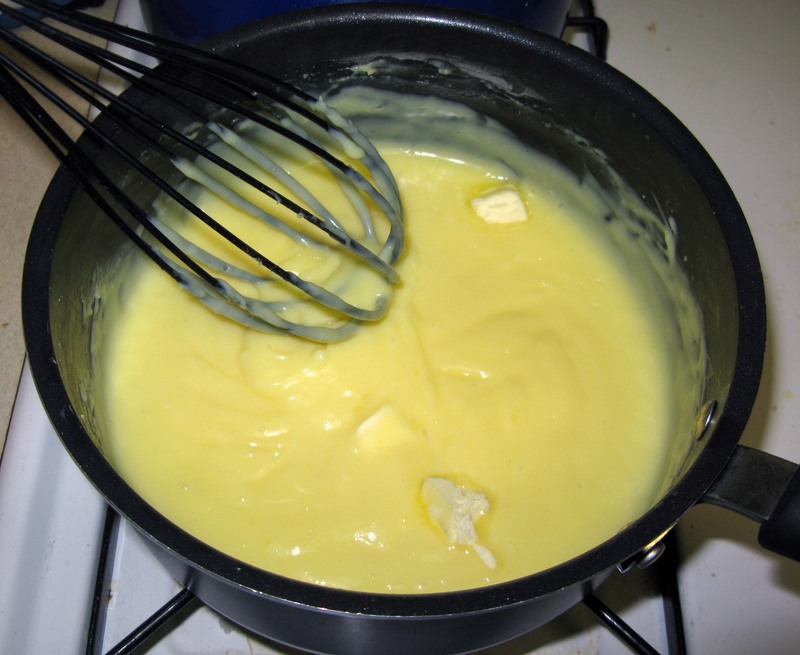 Add the egg yolks and whisk the mixture well until there are no more yellow streaks. Heat the mixture over medium heat and bring it juuuuuust to a boil, stirring frequently. Once it starts to boil, remove the pan from the heat immediately (but leave the burner on). 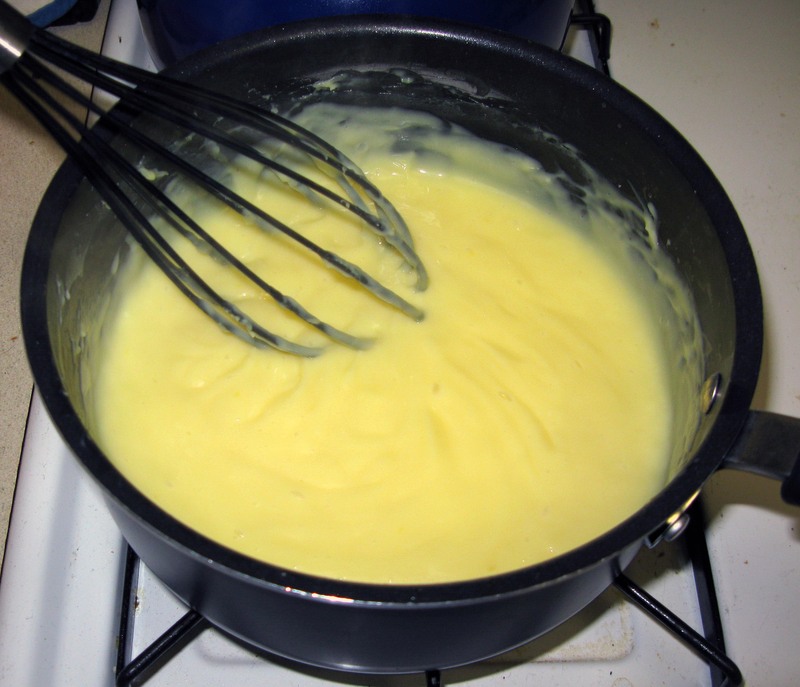 Some clumps will have formed on the bottom, so whisk the custard well until it’s smooth again. Return the saucepan to the heat and bring it back to a boil. Immediately turn the heat down to low to reduce it to a simmer and cook for 1 more minute, whisking constantly. 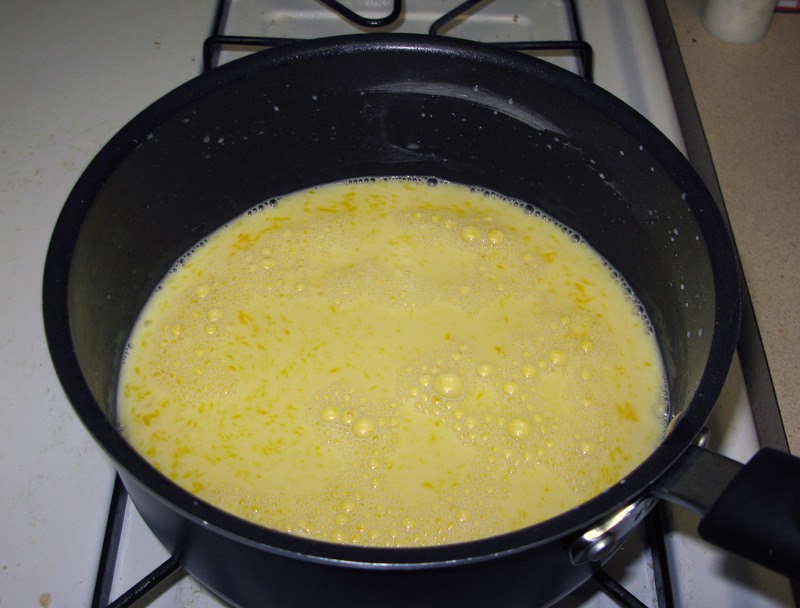 Remove the pan from the heat again and whisk in the butter, 2-3 cubes at a time, and the vanilla extract. 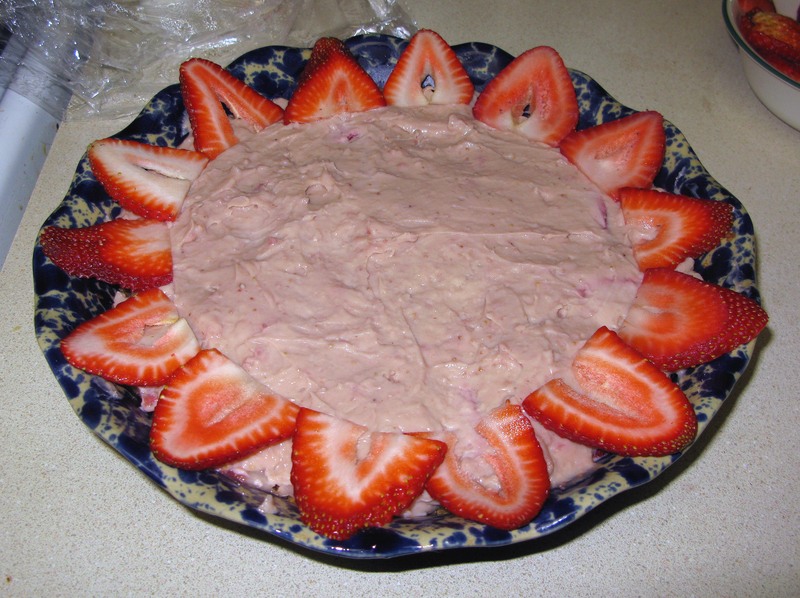 Whisk in the strawberry powder until the custard is as smooth as possible. As mentioned earlier, there may be some lumpy bits of strawberry as they rehydrate, but this is ok. 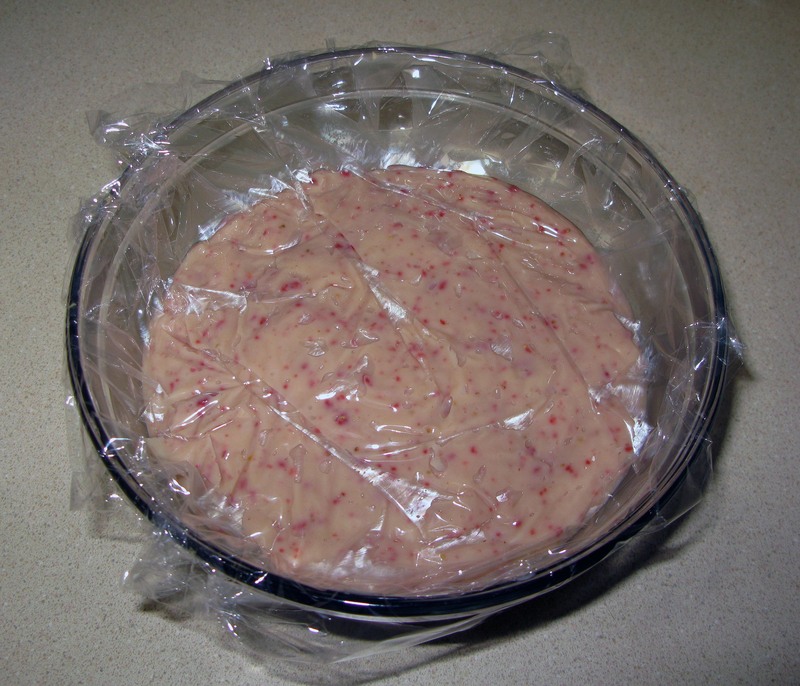 Transfer the finished custard to a medium bowl and press a piece of plastic wrap directly onto the surface. Put it in the fridge to chill until it’s completely cool. When you’re ready to bring it all together, it’s time to slice up some strawberries. Cut off and discard the tops and slice each strawberry into very thin slices (approximately ⅛”-1/16″ thick). Separate out the best-looking slices and save them for the top of your pie. This is optional, but will make your finished pie look at little prettier. 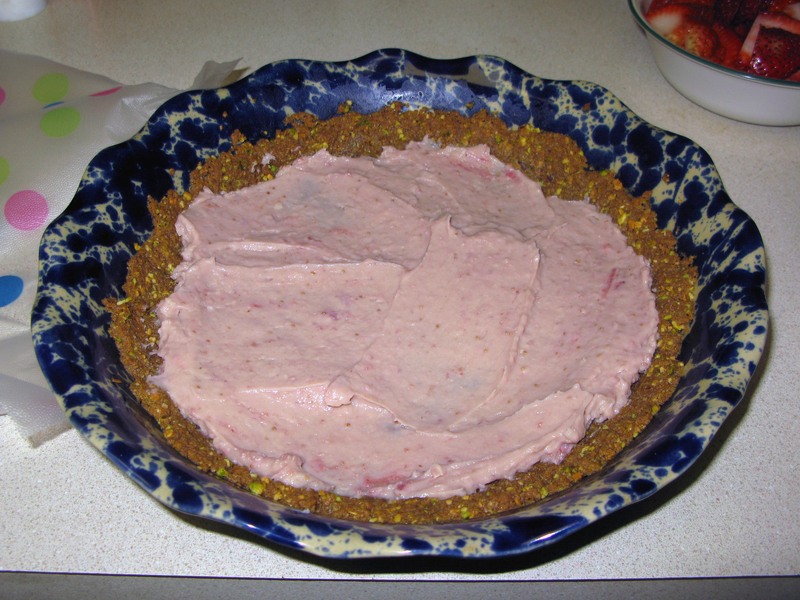 Spread approximately a third of the custard evenly across the bottom of the crust. Arrange a single layer of strawberry slices on top. Repeat the previous two steps twice each (custard-strawberries-custard-strawberries). 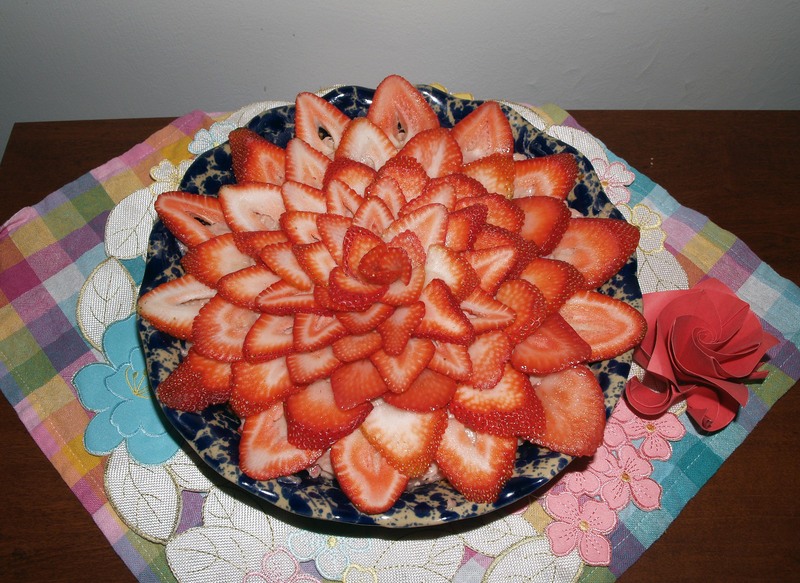 You can just pile strawberry slices on top, or you can arrange them to look like a flower with fairly minimal effort. 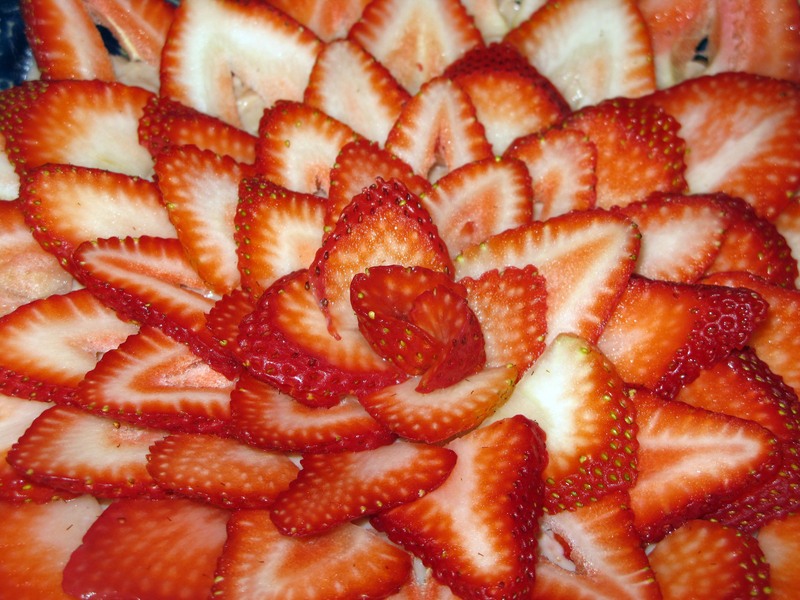 To make the flower, first arrange a circle of the largest remaining strawberry slices around the outer edge of the pie to look like petals. It helps to actually rotate the pie plate while you do this so that they don’t end up oddly tilted. Add another ring of strawberry slices to partially overlap with the outer layer. Continue to add concentric circles of strawberry slices, using smaller slices as your circles get smaller. When you get the the very middle, take two little edge slices and fold them in half. Stick them, interlocked, right into the middle of the flower. That’s all there is to it! Your custard should be pretty set from having chilled completely before assembly, but you can chill your pie for another hour just to be safe if you wish. Refrigerate any leftovers for up to 3 days.